I will be the first one to admit that I am so incredibly proud of us women for pushing the envelope on female solo traveling. It is now more accepted than ever and more and more women of all ages are finally venturing out on their own. No chaperones, no friends, no partner needed. Bravo for all of us. Pat yourself on the back if you have already tried it and loved it. If you haven’t, take your time, do it on your own pace but do it at least once in your lifetime. But going back to the title of this blog post. These are the three islands I felt the safest at while exploring on my own. 36 square miles of green surrounded by blue water, with a volcano rising 985 meters smack in the middle of the island. Welcome to Nevis, the smaller yet oh so pretty sister of St. Kitts. Here, you are as likely to see monkeys and donkeys in the wild as you are to see rum punch on the menu of any of the beach restaurants located on Pinneys Beach. Friendly and helpful locals, great accommodation choices and plenty of fun and adventurous activities, make Nevis one of the preferred Caribbean destinations for many. Yet, the island never seems to be over crowded. There is practically no traffic and to find yourself on a beach with just a few other sun chasers is quite normal. I can honestly say that I have not ever felt threatened, in danger or otherwise uncomfortable during any of my visits to this charming island. Perhaps it is because the average Nevisian knows hospitality like no other or perhaps it is their friendly demeanor and willingness to help. I often get asked which one of the islands in the Caribbean that I have visited so far is my favorite and the one island that comes to mind every single time is Anguilla. I guess it’s the tranquility, the peacefulness and the friendly locals. And let’s not forget the dreamy beaches and the amazing restaurants. The beaches here are unsurpassed. Powdery white beaches with the clearest water you have ever seen, line the shores of this tiny British overseas territory. With a population of less that 15,000 it is not uncommon to bump into the same faces everywhere you go on the island. Anguilla has a way of making you feel completely at home and getting on the ferry back to reality at the end of your stay, is one of the hardest things you will ever have to do. Anguilla is quiet but not eerily so. It is a quiet that is welcoming and even needed at times. The island’s slogan is “Tranquility wrapped in Blue” and I seriously could not agree with this slogan more. It is exactly that, which is also the reason why I find it to be one of the safest Caribbean islands to visit on your own. Sure, the local men might profess their appreciation for your beauty or body type (that’s the Caribbean man for ya) but they also know not to overstep and to admire from afar. The island’s main income is tourism and the people of Anguilla are well aware of this fact. As a visitor you are respected and made to feel very welcome. It’s a beautiful thing, really. What can I possibly say about this 5 square mile island dubbed the Unspoiled Queen of the Caribbean that hasn’t been said before? Saba is an adventure from the time you land on the very short runway and has so much to offer for such a tiny place. Seriously, Saba has a way of enchanting the pants off of you. Great accommodations, from 5-star hotels to nice vacation villas and affordable, yet super comfortable lodgings like Scout’s Place, make Saba one of the best spots for a solo vacation. You know how much I like my belly and Saba has some phenomenal places to chow down at. Get chatty wit the locals, who are not only friendly and caring but love to tell you all about their slice of paradise. Saba, may not be paradise in the traditional sense of the word (there are no long stretches of white sandy beaches here) but it is green and super lush, has amazing hiking and the world’s best diving, and did I mention the views? The population of Saba is just around 2,000 people. It’s more like a community. Don’t be surprised that people in town already know of your arrival by the time you reach your hotel from the airport. News travels very fast on Saba and that is exactly why it is one of the most safest islands to visit in the Caribbean. It is super hard to commit a crime without somebody finding out about it. Also, how would you possibly get away? There are just a few flights and boats departing everyday and by the time you get to the airport or harbor, the authorities will most likely be waiting for you. In all seriousness though, Saba is the safest place I have ever been to. People here still leave their cars and front doors unlocked. There you have it. 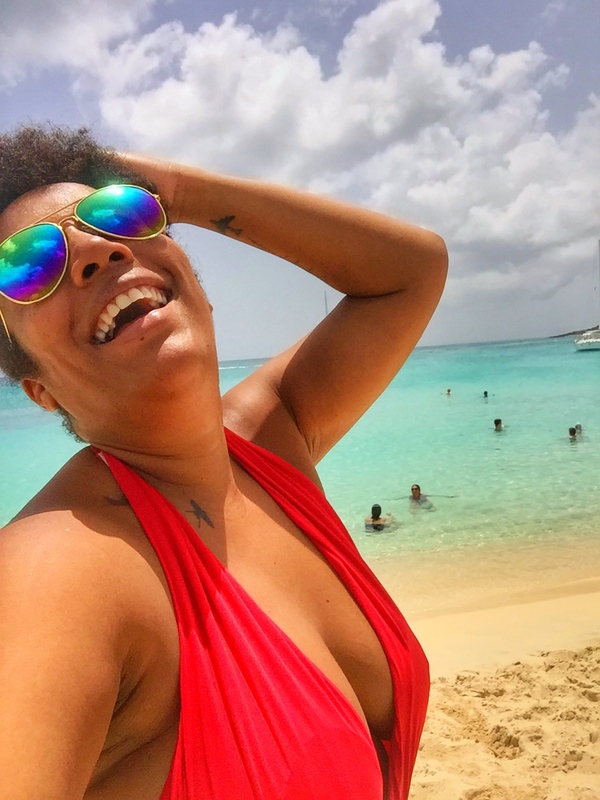 My top 3 safest caribbean islands to visit solo. I honestly can count on just a few fingers how many times I have felt unsafe in the Caribbean. Like everywhere else you visit in the world, solo or otherwise, trust your gut, be responsible, stay out of dark creepy places, don’t insult the locals and don’t get drunk by yourself at a bar. Heed caution wherever you go in the world. I can name a few other islands where I felt completely safe walking down the streets by myself, St. Barth and Bonaire come to mind, but the above is my top 3. What Caribbean island did you experience as the safest? *All opinions expressed above are my own and are based on my personal experiences. Pretty sad I knew my island home of Jamaica would never be near this list. I hope we manage to get our crime under control someday. I have actually not visited your beautiful island yet. Crime there worries me but it will not keep me from visiting. I cannot wait to explore Jamaica.